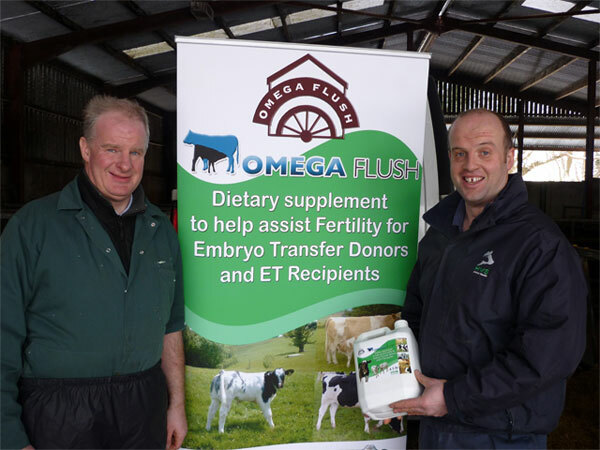 Omega Flush, is designed to optimise the results obtained by cattle breeders from embryo transfer programmes. “Research has shown that Omega-3 and Omega-6 fatty acids both maximise the quality and quantity of eggs produced by the donor animal while also helping the subsequently produced embryos to implant more effectively in the womb of the recipient,” confirmed Paul Elwood from HVS Animal Health. “I have been using Omega Flush in Scotland and Northern Ireland for a number of years,” says Mr Tom Kilpatrick, Embryo Transfer Vet. He added: “When given to donor cows, I have seen a greater number of Grade 1 embryos and a reduction in the number of Lower Grade embryos. The body of research identifying the key role played by essential fatty acids in meeting the needs of breeding livestock, is impressive. The inclusion of Omega-3 fatty acidscan assist cows cycling sooner and more consistently. Paul Elwood added: “Embryo transfer is being used increasingly by local dairy and beef breeders to improve the genetic potential of their herds. However, it remains an inherently expensive technique. Offering Omega Flush to both donor and recipient will help to significantly boost the results obtained.